Over 2,500 people have been arrested across the United States as the Occupy Wall Street movement has spread from its genesis in Lower Manhattan to over 1,000 American cities and municipalities, where occupiers struggle with city officials for control of public spaces. But the previous scenes of mass arrests in places like Chicago’s Grant Park and on the Brooklyn Bridge paled in comparison with the chaos that broke out in Oakland last week. The Occupy Oakland movement has run up against one of the country’s most troubled law enforcement agencies and a community that has grown impatient waiting for its reform. The projectiles police fired in clashes with protesters seriously injured a young Iraq war vet, Scott Olsen, which helped draw national outrage over the scale of force that police used. That sort of violent over-reaction and the tactics associated with it are, however, all too familiar in Oakland, where police have repeatedly responded to public protest with violence and have faced intense scrutiny for shooting unarmed suspects in Black neighborhoods, in some cases fatally. 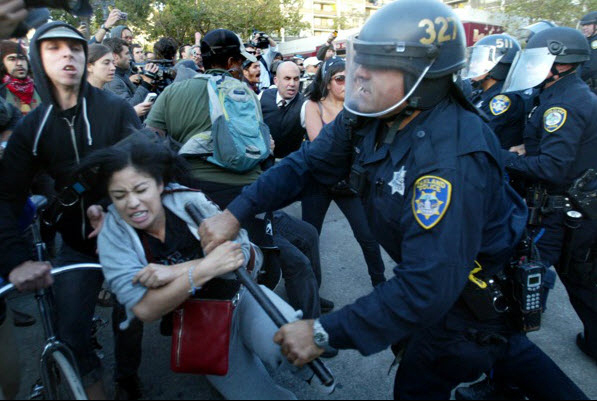 The Occupy Oakland movement has run up against one of the country’s most troubled law enforcement agencies. Police have repeatedly responded to public protest with violence and have faced intense scrutiny for shooting unarmed suspects in Black neighborhoods. 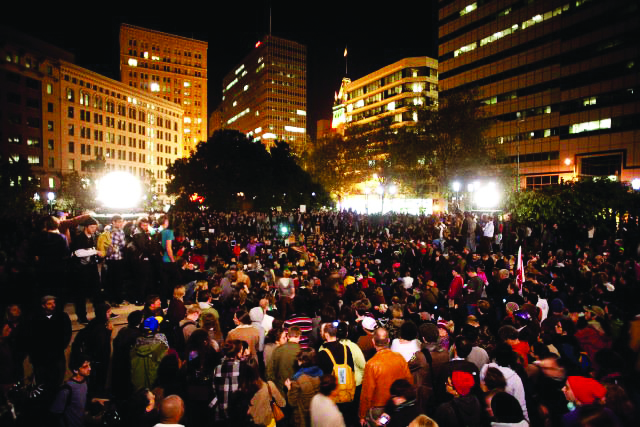 In the early morning of Oct. 25, several hundred officers from the Oakland Police Department and 17 different Northern California law enforcement agencies tore up Occupy Oakland camps, which had been set up in front of city hall and in a nearby park. They arrested 96 people. Tear gas, flash-bang grenades and less-than-lethal munitions were fired into the camp during the pre-dawn raid. Occupiers responded with an afternoon march that by 4 p.m. had swelled to thousands, who marched to OPD headquarters. Some marchers clashed with police, throwing paint and other objects at officers; they were met with batons, beanbags fired from shotguns and tear gas. Multiple confrontations with officers from the California Highway Patrol, Alameda County Sheriff, San Francisco Sheriff and Palo Alto Police took place at the barricaded intersection of 14th Street and Broadway, where several hundred demonstrators took at least five volleys of tear gas, flash-bang grenades, pepper balls and projectiles like lead-filled beanbags. Several people were injured, including Olsen, who suffered skull fractures and brain swelling from either a gas canister, pepper ball or beanbag round. Olsen is expected to recover, but still could not speak as of Friday morning. The munitions that wounded Olsen and other demonstrators at 14th and Broadway were fired by officers from allied law enforcement agencies, but OPD officers gave instructions to fire on the crowd and had already used chemical agents and stun munitions twice during confrontations with protesters earlier that day. All of this was more than a reaction to the Occupy movement. It’s best understood as the latest battle between police and residents in at least two years of civil unrest in the city, beginning with the killing of Oscar Grant by ex-transit officer Johannes Mehserle on New Year’s Day 2009. Violent protests erupted after graphic video of Grant’s death – the unarmed, young Black man was shot in the back as he lay face down on a train platform – became public. Civil unrest broke out again in July and November 2010 after Mehserle was convicted on the lightest charge he faced and sentenced to the minimum prison term of two years and time served. All of this was more than a reaction to the Occupy movement. It’s best understood as the latest battle between police and residents in at least two years of civil unrest in the city, beginning with the killing of Oscar Grant by ex-transit officer Johannes Mehserle on New Year’s Day 2009. 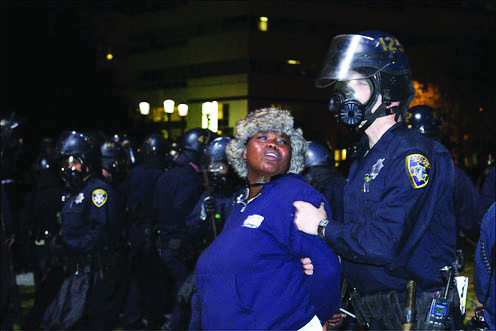 The Oct. 25 violence also brings back ugly memories of a confrontation between OPD and anti-war protesters at the Port of Oakland in April 2003, when a dozen protesters and nine longshoremen headed to work were injured when OPD fired on the crowd with rubber bullets and tear gas. And it’s yet another indication of a police department spiraling out of control despite years of federal oversight. Former Oakland Police Chief Anthony Batts resigned earlier this month, claiming that city officials made his job impossible by micromanaging OPD. The department has been under the oversight of U.S. District Court Judge Thelton Henderson for eight years, since an officer blew the whistle on rogue colleagues who beat, falsely arrested and planted evidence on West Oakland residents. Judge Henderson’s patience with Oakland’s reform efforts appear to be at an end, after watching four police chiefs and three mayors fail to bring OPD up to modern policing standards. He has recently threatened to put the department under federal receivership, which would take all decisions related to police matters out of city control. Among the reforms OPD has not been able to complete in nearly a decade are Internal Affairs investigations of officer misconduct, the department’s use-of-force policy, rules for when officers use their firearms and a system for identifying and dealing with cops who have a history of misconduct allegations. In August, I completed a two-year long joint investigation for Colorlines.com and the Investigative Fund of the Nation Institute that identified 16 officers still on duty who were responsible for more than half of the department’s officer-involved shooting incidents in the past decade. These repeat shooters operate behind a wall of secrecy, built over decades and sealed with a 2006 California Supreme Court decision blocking public access to personnel records. Sixteen officers still on duty who were responsible for more than half of the department’s officer-involved shooting incidents in the past decade. These repeat shooters operate behind a wall of secrecy. Among the worst of them is Sgt. Patrick Gonzales. Over the course of his career, Gonzales has shot four people, three fatally, and been accused of repeated beatings and public strip searches of suspects. In the predominantly Black neighborhoods he has policed for 13 years, Gonzales has long been widely known as a loose cannon. Despite Gonzales’ history of questionable uses of force and the $3.6 million paid out by Oakland to settle lawsuits involving him, he is also deployed repeatedly for crowd control. He was videotaped firing projectiles at anti-war protesters in 2003, he was at the November 2010 protest of Mehserle’s verdict and a photograph of him at the Oct. 25 Occupy Oakland raid shows him wearing a gas mask and riot gear, with a tear-gas canister clutched in his hand. The federal monitors for Oakland’s court oversight have said they will investigate this week’s incident for improper uses of force and violations of Oakland’s crowd control policy, which was overhauled following a $2 million settlement with protesters at the Port of Oakland. OPD and the Alameda County district attorney are also conducting an investigation into Olsen’s injury. Oakland police say they are still trying to determine the identity and agency of the officer involved in Olsen’s shooting. Mayor Jean Quan and Interim Police Chief Howard Jordan have expressed regret over Olsen’s injury, but both defended OPD’s conduct during the raid and march. Jordan said that cops fired the gas and projectiles in response to rocks, bottles and other objects thrown at officers at the camp and during that evening’s march. In the meantime, Oakland officials are projecting the cost of the raid and cleanup in downtown Oakland to reach $1 million, including police overtime and sanitation costs. The cost of mustering officers from nearby agencies is yet to be determined, but it will be paid by the California Emergency Management Agency. 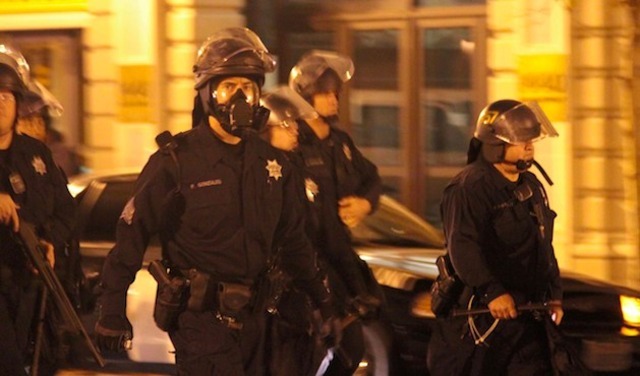 Oct. 25 was at least the fourth call-out of surrounding law enforcement agencies in Oakland since 2009. At this point, Northern California law enforcement agencies that haven’t turned out to Oakland over the past few years are a definite minority. But while questions remain over the conduct of outside law enforcement on Oct. 25, ultimately it is the Oakland Police Department that will have to answer for the scenes of chaos. There is a good chance this latest incident will put Oakland’s short-staffed police department under federal receivership, posing yet another financial quandary for a city with a 17 percent unemployment rate, 30 percent more murders than last year and a general strike set for Nov. 2.